Today it was announced that Archbishop Rowan Williams is to resign as Archbishop of Canterbury and return to academia as master of Magdalene college, Cambridge from December of this year. I am not a member of the Anglican Communion, but my roots still reach back in this direction, and I feel a real sadness at the departure of this gentle, thoughtful and gracious man from his key leadership role. His time as leader was marked by division- over women in ministry and homosexuality in particular. Time and again he has sought to be a bridge for debate and understanding, but the chasms remain between the liberal reformers and the Evangelical wing of the church. Rowan Williams seems to have been criticised from both the liberal side (because of his reluctance to take on the theological conservatives in open warfare) and from the Evangelical side (because of his refusal to stand on a narrow interpretation of scripture on key issues.) But to me, there was always the feeling of deep integrity in all that he did. He has been a leader to be proud of. The Church in it’s widest sense will miss him greatly as it seeks to move into our new context. As for the CofE- what next for the old girl? Who will be the next Archbishop? And what direction will he seek to steer? Can the Anglican Church survive in it’s current form? The Guardian mentioned Archbishop Sentanu– who might yet be the first African born Black Archbishop. Another mentioned is Bishop Chartres, who has been opposed to the ordination of women, and was at the centre of the controversy over the way the church handled to recent protests outside St Paul’s Cathedral. 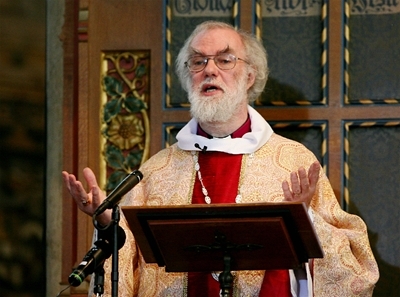 Whoever takes over, they will need our prayers, and could learn a lot from Rowan Williams. Williams was never a popularist- there was little about what he said that could ever be reduced to a sound bite. It was always too thoughtful, too considered, to cerebral perhaps, or too poetic. So by way of grateful celebration for this man who truly has been an apostle in the fullest sense of the word, I will quote one of his poems. He will come like last fall’s leaf fall. By the way- Greenbelt festival have just made all of their rich and varied back catalogue of downloadable talks free, including a couple by Rowan Williams here– well worth a listen. This entry was posted in poetry, Spirituality and tagged anglican communion, church of england, rowan williams resignation by Chris Goan. Bookmark the permalink.